When do I swath? Swathing remains the best and least risky option to manage uneven maturity. As for timing, the goal is 60% seed colour change on the main stem, but wait until the least mature areas have a degree of colour change on the bottom pods. Should I leave it standing for straight combining? With enough time, leaving a pod-shatter tolerant variety to dry-down naturally can be a suitable (and lower cost) option to swathing and pre-harvest spraying. Preliminary results from a project assessing pre-harvest aids in canola suggests these products are less necessary under warm and dry conditions in the late summer/early fall. Do I apply a pre-harvest aid to dry down the green patches? Those set on straight cutting have three product options to consider as pre-harvest aids: diquat, saflufenacil (Heat LQ) and glyphosate. Diquat has the latest application timing of 90% brown seed, which is when 90% of the seeds on the entire plant (not just the main stem) have changed colour. This product may run the biggest quality risk if applied too early, so it should not be used on crops with extreme variation in maturity. Reglone Ion from Syngenta is supported on shatter-tolerant canola only. Saflufenacil has a labelled application rate of 60-75% brown seed, although BASF literature indicates 75% seed colour change (meaning 75% of the seeds on the main stem have a degree of colour change). Talk to your rep about the application timing they support. With an earlier application timing and both contact and systemic activity, this product is better suited than diquat to manage variable maturity. Glyphosate has the earliest application timing of all of the products (labelled at when seed – from the least-mature plants – have less than 30% moisture). Time this application around when you typically would swath (60% SCC). Having an earlier application window and strictly systemic, slow-acting mode of action, this product is a good option for managing variable maturity in non-glyphosate-tolerant canola. If I opt to spray an uneven crop, when should I spray? Diquat stops maturity, so anything immature before application will dry up and blow out the combine. It is not the best choice for fields with extreme variability. If the variety has pod-shatter tolerance, these most mature pods can hold together for three or four weeks while the rest of the field catches up. Glyphosate or swathing would be the better choices for uneven crop. How can hot, dry conditions change the scenario? Rapid crop advancement due to hot, dry conditions can mean the driest pods become brittle in less time – which is especially risky for plants without pod-shatter tolerance. Hot, dry conditions could reduce the ability for late seeds to fill out before shriveling up. What we do know is that swathing early is probably the wrong move, especially if the lower, later areas are also those with more yield potential. Plants in these lower areas will also be rooted into moisture at depth, which means seeds could still be filling despite dry conditions. 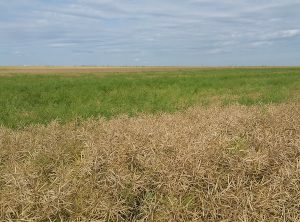 Canola in hot, dry conditions may be better suited to natural ripening or swathing. 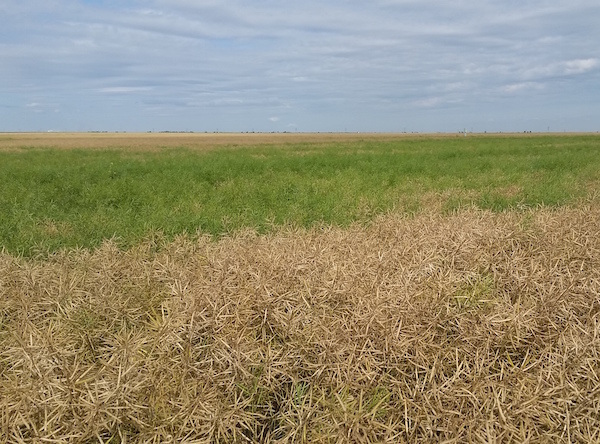 Studies have shown that combine timing for natural ripening is often the same as for pre-harvest-sprayed canola and sometimes even swathed canola.